You never know what you're going to come across when you're looking at remodeling options. When it comes to the bathroom, you'd probably assume you'd just have to deal with the basic components: shower, vanity, sink, toilet. But if you made that assumption you'd be totally wrong. With recent emphasis being placed on the bathroom as a luxury, spa retreat in your home, the products helping you achieve that concept have been growing in numbers. So, when I saw this towel warming drawer I just had to wonder, is this for real? In an era when we're trying to live within our means, create affordable healthcare for all, lessen national debt, and emphasize more responsible consumption, where does a product like this fit in...and do we even really need it? What do you think? 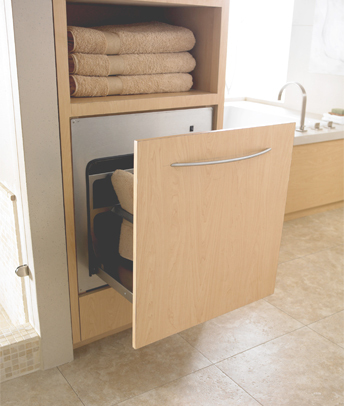 Is a towel warming drawer a waste of its $1,980 price tag? Or, if you've got the money, is it a cool accessory for your bathroom? This entry was posted on Thursday, August 06th, 2009 at 10:08 am and is filed under Bathrooms . You can follow any responses to this entry through the RSS 2.0 feed.